Consult your Canadian Hydrographic Service Marine Chart (see # 3495 - Vancouver Harbour - Eastern Portion) for navigation information. Deep Cove, North Vancouver BC is as much a concept as it is a location. Situated at the extreme eastern end of the North Shore on the Mainland it lies at the base of Mount Seymour Provincial Park. There is no community in the Lower Mainland with more of a mystique. It is where two bodies of water meet, Burrard Inlet and Indian Arm. It has more recreational opportunities within reach than most other communities. 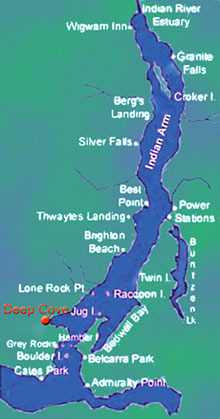 Indian Arm has a long history of its own as a recreational destination. Deep Cove North Shore Marina, nestled in the sparkling waters of Deep Cove, North Vancouver, BC. is a beautiful place to be outdoors, and to be on the water. Deep Cove North Shore Marina offers excellent moorage and boat rentals so you may take full advantage of this glorious area. Within walking distance to the beautiful little village of Deep Cove, a hidden treasure at the entrance to Indian Arm, off Burrard Inlet on the North shore of Vancouver. Indian Arm extends north from Burrard Inlet in Vancouver. The park area was once heavily glaciated, leaving behind a spectacular landscape featuring rugged, forested mountains, several alpine lakes, and numerous creeks and waterfalls, including the 50-meter high Granite Falls. Indian Arm is ideal for motor boating, kayaking, canoeing, and scuba diving. Indian River and the lower reaches of some creeks are perfect for recreational fishing. The old-growth forested mountains provide opportunities for hiking, wildlife viewing and nature appreciation, while the flat beach areas along the shorelines of Bishop Creek provide opportunities for rustic camping, picnicking and other day-use activities. Marine access camping is also available on the south side of Granite Falls.